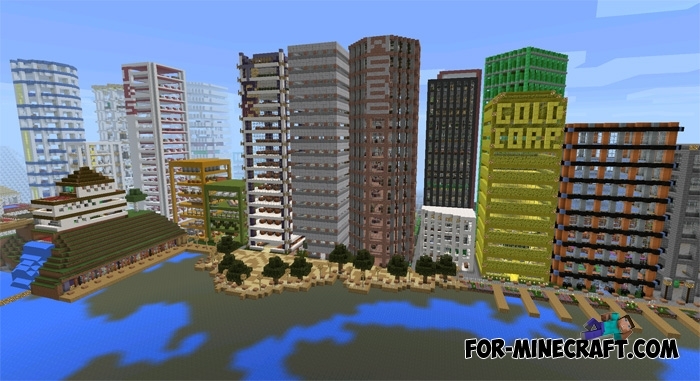 Egaland city is very different from other similar cities for Minecraft PE. This is a very colorful city where every building has a unique appearance. The author has used all available colors in the construction of all buildings. A lot of colors is a distinctive feature of the map. Map is constantly evolving and improving, so be prepared to see even more exciting structures. Furthermore updates appear very often and contain a lot of new things. It's a pretty big update that has spent about a month of work. The main feature is the Louvre Museum. U can visit the many exhibitions such as Minecraft, Dinosaurs, Egyptian and other exhibits. Also, the airport has been changed. The author added a few planes and waiting area. The update was released specifically for 2017. Justineland is a new area that will improve and expand. The new tallest building (it is not difficult to see). There are offices of some well-known companies in the city center, where you can go inside. In addition, there are a stadium, arena, shopping malls, railway stations and other features of a large city. It is necessary to spend a few hours to fully explore the Egaland city.